The Prairie Organic Grain Initiative commissioned the Canada Organic Trade Association (COTA) to publish the fourth report on organic operations and acreage in the Prairies. 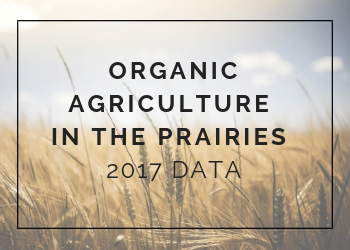 This 2017 data report contains information and statistics on organic operations, acreage, and market growth in the Prairies. Furthermore, the report provides an in-depth analysis of the organic operations and acreage of each Prairie province. Over a third of crop producers and 58% of certified organic acreage is found in the Prairie provinces. Between 2016 and 2017, organic acreage in Canada increased from 1.6 to 1.8 million acres. Saskatchewan represents 64% of organic Prairie acreage, followed by Alberta (30%), and Manitoba (6%). Ninety-one percent of Canada’s organic oat acreage is in the Prairies. There has been a steady increase in acreage of dried peas in the Prairies. In 2017, Alberta had 56,300 acres of dried peas, Saskatchewan had 33,700 acres, and in Manitoba there were 1,300 acres. From 2016 to 2017, there was a growth in the number of organic processors in the Prairies. Manitoba had the most pronounced growth from 50 to 70 processors, Saskatchewan grew from 90 to 105, and there was an increase from 80 to 90 processors in Alberta. The operation and acreage data for this report was voluntarily supplied by certification bodies across Canada and the United States to COTA for analysis and release. COTA and experts in the organic sector conducted secondary research and analysis on the data provided to create this report.